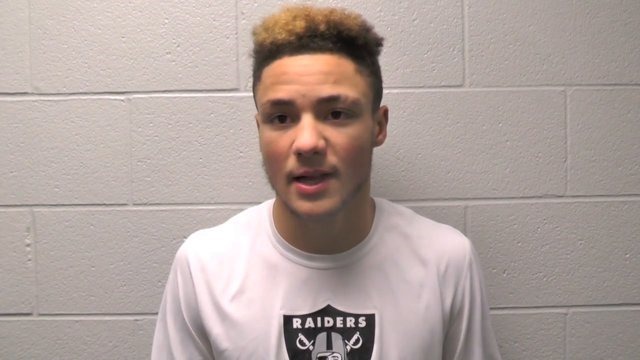 Austin Mack is ready to break his silence and he wants everyone to know that he is committed to playing for Ohio State University for the 2016 season. Mack, who is from Fort Wayne (Ind. ), learned both on and off the field throughout his high school career in training at AWP. Last summer, the Hoosier State standout made the decision to honor his mentors by announcing his college commitment at RAS camp. During the third annual RAS camp, Mack finally spoke out. He will be attending Ohio State to play for the Buckeyes. The 247Sports Composite ranks the 6'2", 205-lbs. player as the 139th prospect overall and the No. 24 receiver in the nation. Mack declined offers from Michigan State, Tennessee, Notre Dame, Alabama and other top-ranked colleges to commit to Ohio State. According to Mack, OSU was the best fit because he would be able to play right away. He also cited the school's medical curriculum as a reason for choosing Ohio State because that is the field he is most interested in learning about. He said he fell in love with the campus and looks forward to spending the next four years there. Mack breezed through summer camp at OSU in 2014 with a 4.4-second 40-yard dash. His performance made him a top recruit for Kerry Combs, Zach Smith and Urban Meyer. Ohio State recruited Mack harder than any other school and it did not take long for the player to decide he wanted to be a Buckeye. Mack said Coach Smith and Coach Meyer earned his trust, which went a long way toward him making his decision to play for the Buckeyes. He was flattered to know that the staff wanted him and took the time to get to know him during the recruiting process. Meyer was serving as a guest speaker for the RAS camp where Mack publicly announced his intention to attend OSU. During his announcement, Mack expressed his gratitude to the coaching staff and said how he dreamed as a kid that this day would come. Mack became the 16th player to commit to Ohio State for the 2016 season. 247Sports now ranks the Buckeyes right behind Florida State, for the No. 1 recruiting class for next year. OSU has received commitments from 10 players ranked in the Top247 and a dozen are graded with four or more stars. Mack is one of those blue chip players.